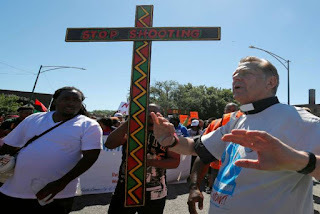 Chicago, Ill., Jul 9, 2018 / 02:12 pm (CNA).- Thousands of marchers joined Chicago priest Father Michael Pfleger to protest gun violence on Saturday, shutting down more than a mile of the city’s busiest highway. Only a portion of Dan Ryan Expressway’s northbound lanes were expected to be closed by the demonstrations, but safety concerns caused police to shut down all the lanes. The priest was pleased with the move, expressing hope that stopping traffic would draw more attention to protestors’ calls for the city to do more to address gun violence. “We came out here to do one thing: to shut it down,” Father Pfleger, pastor of St. Sabine Catholic Church, told the Chicago Tribune. How can this nut job still be a pastor, or a priest for that matter? Oh yeah...because his Bishop is Cupich. Cardinal Cupich also expressed support for the protest. He issued a series of tweets on Saturday, pointing to the power of nonviolent demonstrations, and applauding Catholic involvement. “Non-violent action and peaceful protest have the power to create change. The change we need in this moment is to end a culture of violence and indifference,” he wrote in a July 7 tweet.